Freemans is so non-descript that you may walk by it a couple times before discovering its location at the end of an alley. The walls are decked out in deer busts and other taxidermy-ed décor, along with two cocktail-slinging bars. Freemans is a unique experience, and a place you need to try at least once. Don’t skip the hot artichoke dip served with crisp bread, the roasted pear pancakes, and the five cheese macaroni. 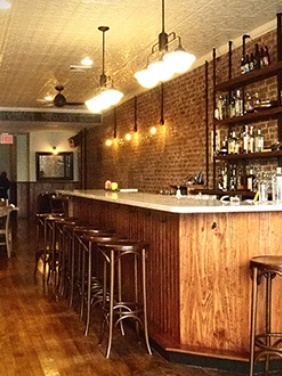 Hunter’s just opened a couple months ago in a cozy, exposed brick spot on Smith Street. 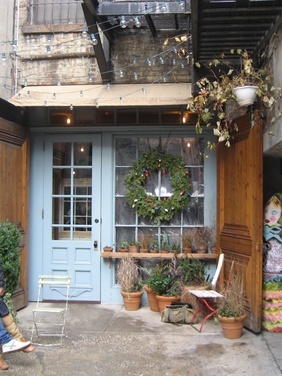 It has touches of the rustic look you expect from new Brooklyn restaurants-- simple and comfortable. A new brunch spot in town. Be one of the first to try it. Hands down the Elvis Stuffed French Toast with peanut butter, bananas, and pecans. For something greener, try the grilled kale salad. Hunter’s serves Blue Bottle Coffee for a caffeine boost, or go all out and sip on the “Katniss Everdeen,” with Apple Jack, St. Germain, White Lillet and Bitters.